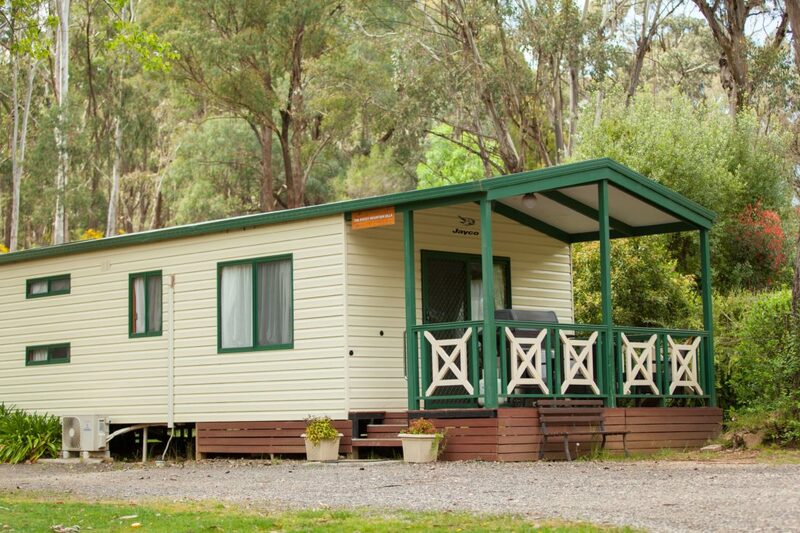 Relax in Beechworth Holiday Park’s beautiful bush environment at the junction of silver and spring creeks. Experience a taste of the alfresco cafes, fine dining, gourmet local produce and specialty shops that Beechworth and surrounds has to offer. Pleasant accommodation for up to five guests. With a wonderful rustic charm, Kelly’s Cottages sleep up to five people and are perfect for an economical holiday for a family or a couple. These cottages have great views of the natural bushland that the park is located in. They are close to the creek, bushwalking tracks and kids adventure playground. Each cottage has a queen bed and triple bunk beds. They have kitchen facilities, reverse cycle heating/cooling, a flat screen television with DVD player as well as a spacious veranda complete with barbecue. Linen, blankets and towels supplied to the queen bed only. Additional packages can be hired at a one-time cost of $10 per bed. Cabin accommodation is non smoking and pets are permitted on verandas only by request. Great value for up to six guests. The bright and fresh Family Cabins come packed with every convenience for the perfect family holiday. Not only are these cabins great for families they are also excellent for groups such as cyclists and bushwalkers. With an open plan feel, dining area with television with DVD player, fully equipped modern kitchen with full sized four burner gas stove and a large bathroom, everything you need is right at your fingertips. Linen, blankets and towels are supplied to the double bed only. Additional Linen packages can be hired at a one-time cost of $10 per bed. Please note, cabin accommodation is non-smoking and no pets. Powered sites – beautiful shady grassed sites or pebbled dry weather sites. The Park has two areas of powered sites, both set in a natural bush park environment with individual town water and sullage. Unpowered sites – beautiful sites on the creek. Sit around under the majestic shady gums along the junction of Silver and Spring Creeks while you boil a billy on your own camp fire or spot plenty of native wildlife. The clean and refurbished amenities block is only a short stroll away, along with the crystal clear pool for refreshing dips. Fire bins are available and wood can be purchased from the office for $10 per pack or you are welcome to bring your own. Sleeps up to six people in two bedrooms. The spacious two bedroom Rocky Mountain Villa is a great affordable option that sleeps up to six guests. It is located in the middle of the park close to the pool and overlooking the playground and powered campsites. This cabin comes fully equipped with all that you need to make your stay with us relaxing and enjoyable. Linen, blankets and towels are supplied to the main bedroom only. Additional Linen packages can be hired at a one-time cost of $10 per bed. Please note: cabin accommodation is non-smoking and no pets. Modern studio accommodation for up to three guests. Cameron’s Cabin is a queen bed cabin that can accommodate up to three guests as it also boasts a fold-out futon. Cameron’s Cabin is an affordable and convenient alternative to a hotel or motel. It comes packed with features, including a queen bed with electric blanket, a fold out couch, cooking facilities and fridge, a large ensuite bathroom, reverse cycle heating/cooling and a flat screen television with DVD player. Linen, blankets and towels are supplied to the queen bed only. Additional linen for the futon can be hired at a one-time cost of $10. Delux accommodation for up to seven guests. The three bedroom deluxe villa can accommodate up to seven people and is situated next to the pool in the middle of the park. This villa boasts one queen bed, one double bed with the option of a fold down bunk and two bunks in the third bedroom (the bottom bunk can fold up to provide space for a porta-cot). Linen, blankets and towels are supplied to main bedroom only. Additional Linen packages can be hired at a one-time cost of $10 per bed. Charming studio accommodation for up to two guests. The cheerful and charming Guy’s Cabin offer’s great value for couples or singles with a queen bed, cooking facilities and a fridge, a modern bathroom, reverse cycle heating/cooling as well as a flat screen television with DVD player. Linen, blankets and towels for the queen bed are supplied in this cabin. Roomy accommodation for up to eleven guests. The Tree House is an elevated house sleeping up to eleven people with two separate queen bedrooms and a bunk room that has two double bed/single bed bunks and one single bed. It has full kitchen facilities with open plan living, a wood fire, reverse cycle heating/cooling and a barbecue on the balcony. The tree house has a flat screen television with DVD player, sun room, balcony/veranda and lovely views of the park and natural bushland. Linen, blankets and towels are supplied to one main bed only. Additional Linen packages can be hired at a one-time cost of $10 per bed. Ensuite accommodation sleeping up to four guests. Delightful and affordable cabins that sleep up to four people, the Miner’s Cabins are perfect for a family of four looking for an easy holiday. Boasting one double bed and two single beds, or one double bed and one bunk bed (bedding configurations may change). The single beds are separated from the double bed by a wooden partition and curtain. Our Miners Cabins have cooking and kitchen facilities, a large fridge and reverse cycle heating/cooling. There is also a flat screen television and DVD player for entertainment. Linen, blankets and towels are supplied to the main double bed only. Additional linen packages can be hired at a one-time cost of $10 per bed.